Every year, we take the leaders in our classroom on a hike. These students have proved themselves responsible, so we give them leadership in the class. With 51 students, we need a little help! The leaders assist in keeping their table on task. Because of the weather this fall, we decided to take them to the Dungeness Spit rather than Mt. Townsend. Taking advantage of 'the Olympic rainshadow,' we didn't get a drop of rain. There were 13 students and six adults on the hike. One group made it all the way to the lighthouse (5 miles each way) The other group (which I was with) took a more leisurely pace and made it about half-way. After waiting a while for the lighthouse group to return, I sent the group ahead to the Sequim swimming pool while I waited for the other group. As the hours passed, I found a warm spot in the sand and took a nap. On wakening from my snooze, I glanced at the water and took a double take as a male orca with it's tall straight dorsal fin surfaced and submerged. I kept watching as it repeatedly surfaced, sometimes spouting. There was no one to share this with as I was all alone on the beach. I wondered if anyone would believe me. Fortunately, the group coming back from the lighthouse had seen him too; as well as a female and some younger ones. We joined the earlier group at the rec center and enjoyed the warm pools. Amy and I were spying on you guys from the top of Snowy Hurricane Ridge! We went for a hike on Sat. 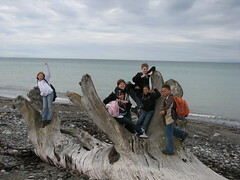 hey mr.B it is I kaleo do you still have last years neah bay trip pictures? cause my teacher said that she would like to see them in my writing project.ps: tell everybody I said hi.